Irish amateur golf is now an international game with as many as 49 overseas events included in the list of "main fixtures" provided by the Golfing Union of Ireland for 2016. Irish golfers will not necessarily be sent to all events but with trips as far away as South Africa, the Dominican Republic, Peru and Australia listed for January alone, the cost is likely to be considerable. The Irish Close is visiting the Inishowen Peninsula for the first time. Slated for the end of May, the Close will run from 16-20 August. Home to the Ladies' Irish Open in 1998 and the North West of Ireland Open in 2002, the last major amateur event to visit the Glashedy was the Interprovincial Championship 10 years ago. ntrusted to renowned architects, Pat Ruddy and Tom Craddock, the Glashedy was only established in the mid-90s but it is hard to imagine a time when the course did not exist. The course has been strengthened in recent years as Pat Ruddy returned to one of his favourite tracks. Through a strategic repositioning of bunkers, the sand traps are now more prominent. The original course record was set back in 2002 by Scotland’s Andrew Coltart during the North West of Ireland Open and since Ruddy’s revamp in 2011, Belfast pro Peter Martin has added another 67. 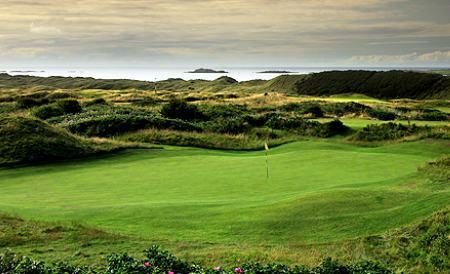 Ballyliffin will also host the Boys Home Internationals on the Glashedy Links from 2-4 August. Meanwhile the Irish Boys Championship returns to Dublin in 2016. Castle Golf Club in Rathfarnham will welcome the island’s brightest young talents from 28 June to 1 July. Last year the title went abroad as French amateur Adrian Pendaries won at Tuam. Royal Dublin is host to the GUI’s premier championship, the Irish Amateur Open, which returns to Dollymount from 5-8 May. Fota Island will host the Interprovincial Championship from 4-6 July while the Irish Youths visits Galway from 24-26 August. The dates for next year’s provincial championships have also been confirmed. The season begins in earnest at the West of Ireland, which will run from 23-29 March at Co Sligo. The East of Ireland returns to Co Louth on 4-6 June while the North of Ireland runs from 11-15 July at Royal Portrush. Lahinch is the venue for the South of Ireland from 20-24 July. There is a new addition to the fixture list for 2016 with the addition of the GUI All Ireland Inter-Club Four Ball Championship. Open to all those aged over 30 on 1 January, the GUI All Ireland Inter-Club Four Ball Championship is limited to players with a handicap of 16 or more. Each team shall consist of 10 members, five pairs, and the minimum combined handicap for each pairing is 36. All matches will be played off scratch, similar to existing inter-club events like the AIG Pierce Purcell Shield and the AIG Jimmy Bruen Shield, which are played by foursomes. GUI "MAIN FIXTURES FOR 2016"
Apart from the unfortunate clash of the Irish Open at Royal County Down with the first two days of the East of Ireland Championship at Baltray, the golfing calendar looks promising with the Interpros at Rosapenna, the British Senior Amateur at Royal County Down, the Home Internationals at Royal Portrush and the Irish Close at Tramore. The Dunluce Links at Royal Portrush, venue for the 2014 British Amateur Open Championship from June 16-21. Picture © Royal Portrush GCThe Munster Branch has come through with some updates to the Irish Men’s Amateur fixture list we published recently. Seapoint Golf Links in Co Louth is the venue for the Irish Amateur Close Championship from June 7-11 next year. Picture © SeapointGolfLinks.comThe GUI’s Venues and Fixtures Committee has confirmed the vast majority of next year’s men’s amateur calendar, resolving several clashes and finalising most venues.